The Vets Center is in Electric City, just south on highway 155 from the post office. Nineteen new flags will be dedicated during the "Isle of Flags" Memorial Day ceremony next Monday, May 30, at Spring Canyon Cemetery. Flags for the following are being dedicated: Harold A. Blanchard, Bruce A. Brandstrom, Alfred Braaten, R.I. Button, Warren H. Byam, James Bradley "Brad" Combs, Douglas Gronski, William R. Hart, Jack A. Hilson, James Timothy Hurley, David A. Kelley, Marvin E. Kuest, Aleck T. Musyt, Diana M. Meyer, Leon Lee Nuehring, W. "Steve" Nuehring, Clark C. Reynolds, Ernie Sprugel and Farrell Glenn Ware. This is the 40th year for the Isle of Flags ceremony, and there will be 550 flags flying for the celebration for veterans on Memorial Day, according to Ben Alling, president of the flag committee. The ceremony will begin at 11 a.m. Monday, and this year's featured speaker is Cindy Jayne, American Legion Post 157 commander. Flags go up Saturday, May 28, and will be retired at 3 p.m. Monday. Volunteers are needed both to put the flags up at 1 p.m. Saturday and for retirement at 3 p.m. Monday. The Memorial Day breakfast is from 7–11 a.m. Saturday, May 28, at the Vet Center in Electric City. Master of ceremonies for Monday's program is Navy retired Capt. Richard Black. He will also have the dedication of the flags ceremony. Spring Canyon Cemetery is on the road to Spring Canyon Campground, off highway 174, toward Wilbur. Boy Scout Troop 24 and Cub Scout Pack 24 will handle the ceremonial folding of the American flag. Pat Zlateff, LTC retired, will place the memorial wreath. Isle of Flags association members are World War I Barracks, No. 2009; American Legion, Post No. 157; Veterans of Foreign Wars, Post No 3157; Disabled American Veterans, Chapter 38; World War I Auxiliary, No. 2009; American Legion Auxiliary, No. 157; Veterans of Foreign Wars Auxiliary, No. 3157; and the Grand Coulee Dam Lions and Rotary clubs. The public is invited to the Spring Canyon Cemetery dedication ceremonies. The Vets Center is located on highway 155 just south of the Electric City Post Office. 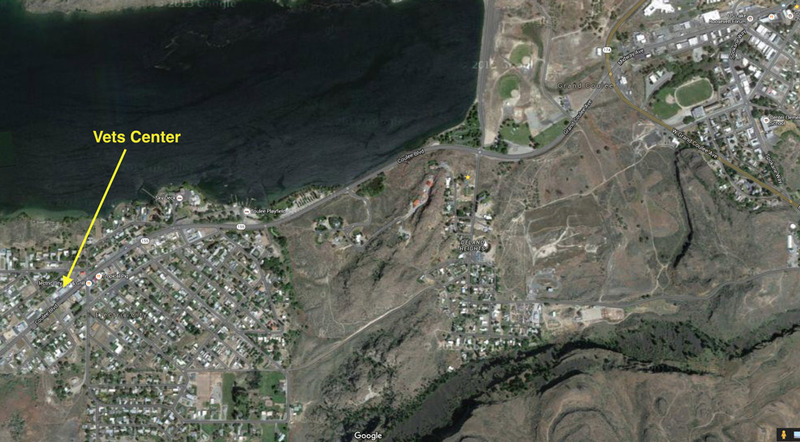 Spring Canyon is off highway 174 southeast of Grand Coulee on the lake side, on the road to Spring Canyon Campground. I've added directions and aerial images with arrows indicating the locations of the events. I'm new to the area. A google search doesn't provide an address for either the Spring Canyon Cemetery nor the Vet Center in Electric City. Can anyone please tell me where these are located? Thanks!